Classical music fans are flocking to the Walt Disney Concert Hall for the Los Angeles Philharmonic’s 2017-18 season, which opened on Sept. 26 with a star-studded concert and gala. 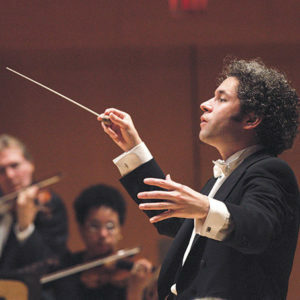 LA Phil music and artistic director Gustavo Dudamel led the orchestra in an all-Mozart concert based on the composer’s early years. Enjoy more by Mozart from Sept. 29 through Oct. 1, when Dudamel conducts the orchestra in performances of “Mozart 1791: Final Piano Concerto” with pianist Javier Perlanes, mezzo-soprano J’Nai Bridges, tenors Paul Appleby and Jon Keenan, and accompaniment by the Los Angeles Master Chorale. The performances are symbolic of the final year of Mozart’s life and provide a glimpse into the extraordinary works the composer might have written had he lived past age 35. The LA Phil’s new season also includes an additional chamber music performance of Mozart’s music on Oct. 3, and “Scenes From The Magic Flute,” based on a Mozart opera, from Oct. 5 through 8. And that is just the first two weeks. Dudamel, a musical prodigy born in Venezuela, has an artistic vision for the LA Phil’s 99th season that builds upon the orchestra’s commitment to innovation and excellence. In addition to Mozart, some of Dudamel’s favorite composers, such as Leonard Bernstein and Robert Schumann, will be highlighted in the upcoming season. In late November and early December, the orchestra will celebrate the 100th anniversary of Bernstein’s birth with the seldom-performed work “Mass,” along with “The Serenade” and “Chichester Psalms” and a screening of the film “West Side Story” with orchestral accompaniment. The LA Phil will conclude its season next May and June with Schumann’s four symphonies and two of his greatest concertos. Another highlight of the LA Phil’s 2017-18 season is “CDMX,” a festival that kicks off on Oct. 9 focusing on the creativity and contemporary music culture of Mexico City. Dudamel conducts the Walt Disney Concert Hall debuts of pop-rock singer Natalia Lafourcade and alt-rock band Café Tacvba. The season also includes a film night celebrating Mexico’s contributions to the medium, the world premieres of commissioned works by Arturo Márquez and Gabriela Ortiz, a Green Umbrella concert featuring five world-premiere commissions, and “BiRDMAN Live,” a screening of the movie “Birdman” with a performance of the score by Antonio Sanchez. Dudamel also welcomes special guests such as conductor laureate Esa-Pekka Salonen, who returns to conduct three of his concertos with soloists Yefim Bronfman, Leila Josefowicz and Yo-Yo Ma; Susanna Mälkki, who is marking her first season as the LA Phil’s principal guest conductor; and Yuval Sharon, who returns for the second year in his residency as artist-collaborator. Couple those highlights with performances of new works, a jazz series and movie-themed programming including “The Oscar Concert” featuring nominated scores, and the upcoming season promises to be unforgettable. Dudamel also extended a warm invitation.